HUFFPOST, July 2016, How a writer built the homeliest Guesthouse on Serifos. One day, a couple of summers ago, I happened on a friend’s photos as I was clicking through FaceBook. She’d just come back from a holiday on Serifos. Most of the photos had a lovely stone house in them, which really seems at one with the wild beauty of the island. Bowls of fresh fruit, fresh cheeses, sheets billowing on the line beside rows of vines, colorful hammocks, veritable feasts laid out on stone tables beneath a star-spangled sky—it all made me think she must have a house on the island or that some friend had put her up. But, actually, neither was true—or not entirely true. The lovely house was a guest house, but it was a million miles from the ‘classic’ Greek ‘rooms for rent’. For lack of a better word, it was far more homely than that. In fact, its every little detail filled you with an irresistible desire to visit—and stay there forever. A few days ago, when I was spending time in another heavenly and homely guesthouse on Tinos, I remembered that lovely stone home on Serifos. But this time I did a bit of googling and found out that it is The Writer’s Home & Guest-home, the creation of the author (hence the name) Vici Theodoropoulou, who runs it still. Vici studied History in Athens and Paris and worked, among other jobs, for Greek state radio, producing broadcasts for its Third Programme and for Tachydromos magazine as a journalist. Her first novel, Letter from Dublin (published by Estia) won the Maria P. Ralli award for a first novel in 1997. She found the place she’d always sought on Serifos, a place to live, to create and to become one with the locals, making it ‘her place’. Which, more of less, is how The Writer’s Home & Guest-home came into being. I’ll let Vici take over now and tell you all about herself. How did the idea for the Home & Guest-home on Serifos come into being? What’s your link to the island? I had a dream: to chose a Place and make it My Place, to get to know the locals and the non-locals who had made the Place their home, to live with them, to make that Place mine. And I think I pulled it off: Serifos really is my place now. I visited the island for the first time in 1980—I only stayed a few days, but there was a connection there! I thought to myself, “Now here’s a place I want to come back to”. And I did, thirteen years later, when I bought this plot of land—mainly because of this huge boulderstone you could sit on and stare out the sea to the accompaniment of the waves. But also because it was right next to the lovely little hamlet of Rammos and a fifteen-minute walk from the Port. By 1997, I had a plan: to built a humble house here which respected the winds and the wisdom of traditional Cycladic architecture. 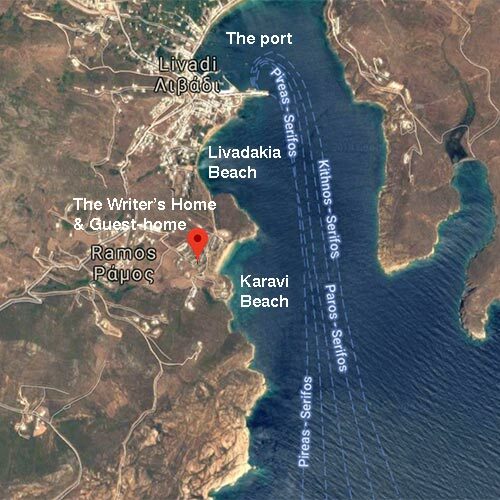 When my architect friend had drawn up the plans and submitted them, the authorities noted their value and characterized the building as a “model dwelling for the Cyclades”. I was so proud. By 2000, I’d built a house for my family and a guest-house for our friends. The idea of the Home & Guest-home was born in 2010 when I found myself alone and in financial difficulties with the Crisis just getting underway. One prerequisite for success was that I’d always loved having and looking after guests, another that I wasn’t afraid of hard work. So I rolled up my sleeves and threw myself into the project. I was sure that when the guest house was ready to meet the needs of a Guest-home, as I’d already imagined it, then I could host nice people who would both appreciate it and show their appreciation. How easy was it to build a stone house on Serifos in the 1990s? What obstacles and difficulties did you encounter? How did the locals react? How much help did you get? I got the most help from the local island craftsmen. They wanted to built in stone; they wanted to build a house like one their fathers would build if they were still alive. Most importantly of all, they had the knowledge needed to build that house. I respected them and they respected me. There were lots of obstacles, lots of difficulties. But I suppose there always are when someone wants to create something that sounds strange but is just different from the norm. What materials did you use to build it and how long did it take? My take on life, my personal finances and my aesthetic could all be described as ‘low-budget’. I believe there are ways and means of building wonderful structures that don’t cost much. I’m utterly opposed to the view that throwing money at something is somehow a guarantee of quality. As I see it, quality comes from having a vision, from taking a project into your heart, from being inventive, having a point of view and putting the work in. So at every stage in the project, I looked back at how they used to do things: Coloured cement floors like they made back in the day, wooden door and window frames, doors wrought by the local carpenter, local stone of course, indigo in the lime to give the bathroom that wonderful sea-blue hue, and so many other things. Plus regular maintenance, of course, and loving care—any house exposed to the salt of the sea and to the winds needs plenty of both. The time depends on your stamina, because a project like this presumes your involvement in every detail which will one day look as though it were there forever, even if it was only built a few years or days ago. Because the more aware you become of what’s needed, the harder you struggle to cover those needs. In a way, no building is ever really finished. What’s the Guest-home’s core philosophy? We share. We care. We appreciate. We enjoy. We take pleasure. We thank. That’s the core philosophy of the Guest-home; it’s expressed in the first-person plural because that’s how we all feel here. Those of us who prepare to welcome and host, and those of us who come to spend a few days on the island with the Guest-home as our launching pad and refuge. The space is arranged so guests can enjoy their private moments undisturbed, both those who stay in the guest-home and those who stay in the home. There are four separate courtyards, a small sheltered one and a large one for guests staying in the guest-home and another two—one with morning shade and a view of the mountain and one with afternoon shade and a view over the sea and surrounding islands which are set aside for guests staying in the home. What was it like when the Guest-home started out? Clear skies, but I was apprehensive. Who were these strangers who’d be staying in my home? But it didn’t take long to realize that there are people in the world with whom you share a vision but simply haven’t had the good fortune to meet yet. And my fears melted away. I’m now a proud guest-home host. I learn from the people who come and stay here, from what they found and enjoyed and what they would have liked to find. Even when everything seems just right, I wrack my brains to think of something else I could offer to make their stay even better. I want to make sure everything’s in place for an unforgettable holiday experience, with whatever that may entail. What does a stay at the Writer’s Home & Guest-home include? Clean, fresh-smelling, hand-made cotton bed linen and towels, fully-equipped kitchens in both the guest-home and the home, desks for working at in peace, books of course in different languages—I encourage my well-read visitors to leave a book or two behind for their successors to read and they’re delighted to do so. Last year, I started stocking up on contemporary Greek literature in translation; I’m interested in getting foreign readers and Greek literature together. Wi-fi everywhere for those who want to combine their holiday with work and keep in touch, comfortable courtyards for lazing around in, chatting, reading or study. And, if luck’s on your side and you’re here at the right time: figs, grapes, pumpkins, pomegranates, mulberries, peppers, tomatoes, aubergines and everything else that grows in our grounds. What makes you stand out from the other traditional rooms for rent on the island? I’d say the Guest-home was more a bearer of hope than tradition. In these incredibly hard times in which we live, we need to get away to places where we can feel we’re not alone, that if we try hard enough we might just manage—despite it all—to live in a better world. And I think the Writer’s Home & sweet Guest-Home and the many other spaces like it in Greece and abroad deserve to be seen as bearers of hope. Fortunately, an entire community is slowly coming into being which, despite all the difficulties, keeps creating wonderful guest homes where more and more travelers are finding what they’re looking for. Which is to say a place where human contact, homely care and attention to detail are redefining hospitality, and where hospitality is forging connections that link travelers to a place and its people. I have a list of at least four guest houses on mainland Greece which I can’t wait to visit for a short break. Has the economic crisis affected you? How have you responded to it? Globally, travelers’ financial and psychological reserves would seem to be drying up. There was no avoiding the impact of the economic crisis and the events taking place around us. I talk to non-Greeks about the difficulties, about the different ways families, couples, friends try to take charge of their lives so they can get away from their oppressive everyday existences for a while. I get the impression that the vast majority of us who meet here in the Guest-home—maybe all of us—are doing everything in our power to deal with the situation. By keeping a cool head, by helping others, by working hard and—above all else—by maintaining an open mind. And we end up agreeing that the world’s changing and that you can’t get stuck on where you were and what you had. Sitting in the corner crying isn’t going to help anyone. You’ve got to change, too. You’ve got to keep up with the times, come up with new approaches and have the courage to set out in new directions you never imagined yourself exploring in the past. Have you stayed in touch with people who have stayed at the guest-home? Have you any unforgettable stories to tell us about visitors you’ve had? Absolutely! Many friendships with visitors young and old. If I could, I’d take up all the offers of hospitality I’ve had from around the world. For now, though, they come back to Serifos. Little Nina is a guest I’ll never forget. She took her very first steps here in the courtyard after 25 days in the guest-home with her parents, Ioanna and Alex. And the throught of Evelina and Peter will always bring a smile to my face, who came in early April from Sweden to celebrate Peter’s Ph.D. in Comparative Literature in shorts and suntops, when I’d turned the world upside down to ship a hi-tech electric blanket over from Athens to keep them warm. And the memory of me in my jumper watching them splashing around in the sea down below the Guest-home on their first day as though it were August, shouting up to me “Hey Vici, this is a great summertime!”. Then there are Zorana and her second-hand book-seller companion, Pedja, who are friends now after two satisfying summer stays in the Guest-home: we often giggle over the first time Pedja went crazy over some home-made candied sweets made on the island and wolfed the whole jar down in a day—we couldn’t keep up with him. Get me in the mood and I could tell you tales about the guests for hours on end! What role does Serifos play in the overall experience of a stay at the Writer’s Home & Guest-home? What do you think the island has to offer visitors that makes it unique. Serifos has retained its innocence; and that’s a rare thing. Above and beyond anything else, the Guest-home strives to remain in a state of innocence. I hope we manage to stay that way, well-intentioned and generous. We’re a rock in the Aegean, awash with natural beauty and graced with indescribably beautiful beaches. And winter here is an experience, too, as I’m forever reminding people. And, if I may add something half in jest but half-seriously, too, something we used to say after a few glasses of wine: Serifos is an island closer to the stars. What’s the best time of year to visit Serifos, and what are the five things a visitor simply has to do? Spring is heavenly. Summer is a feast. Autumn is a privilege Winter is a gift. The choice is yours. And each season comes with its own top five things to do. But I’m not very good at making lists like that. I’m a believer in the Situationist derive as a means of visiting and exploring a Place. Meaning you allow the Place to take you where it will and thus discover it in your own Way.